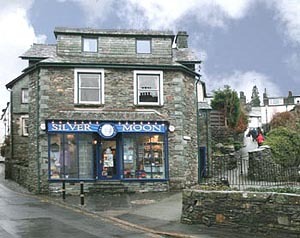 Above Stock is a two floor apartment over an interesting gift and accessories shop. The apartment has its own stepped entrance from the picturesque footpath to the right of the picture. It sleeps four in one king-size double and one twin room. There is also space for a cot in a small separate room. 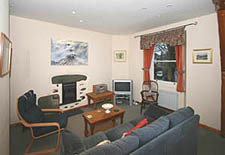 There is full central heating.The apartment is ideally placed in the town centre, just a step away from all amenities. 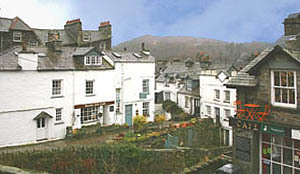 There is a good view across the town to the fell beyond. Many walks, both easy or strenuous, start from the door. Parking is available in the quiet streets nearby or public car park. The apartment is newly decorated and well furnished. 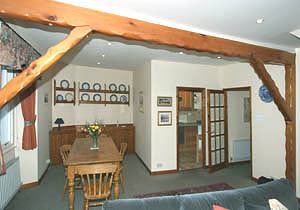 Accommodation downstairs consists of a spacious lounge/dining room with beamed ceiling, a well equipped kitchen, and a small room which can be used for a cot or for outdoor gear storage. 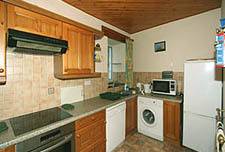 The kitchen has an electric oven, microwave, dish washer, washing machine, fridge and freezer. In the lounge there is a good selection of books, a TV and a DVD player. The owners live nearby and are normally available in the event of any difficulties. Upstairs there are the two bedrooms and a bathroom with bath, shower over, wash basin and WC. The apartment is open all year, with weekly bookings from Saturday to Saturday. Terms are from £280 to £480 per week according to season. Gas, electricity, bedding and hand towels are all included. 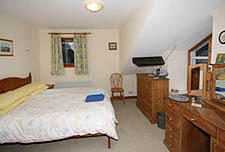 Short breaks may be available during quiet periods, please enquire. We regret no smoking and no pets. For bookings and further information, please go to Above Stock website or e-mail the owners at enquiries@abovestock.co.uk, or phone 015394 34031.